SQL server updates or service pack hung or failed to install!! When installing sql server update or service pack, one of the reason to fail if you have invalid registry settings stored from previous installations and may not be valid anymore due to the change in location of the binaries when you installed previously. I recently had an issue while installing sql service pack 3 for sql 2008 r2 and thought it would be useful to share. When ever your installation hung and does not move forward or failed, you can look into the installation logs that can be found under, C:\Program Files\Microsoft SQL Server\100\Setup Bootstrap\Log and every time you try to install it creates sub folder with logs in it, so check the time stamp for the current installation logs. Search through installation for any errors. Here is the sample of the error I got and the reason for the installation hang and never moves forward. MSI (s) (0C:34) : SOURCEMGMT: Attempting to use LastUsedSource from source list. MSI (s) (0C:34) : SOURCEMGMT: Trying source \\************\sql\Microsoft SQL Server 2008 DEV R2\x64\setup\sql_engine_core_inst_msi\. MSI (s) (0C:34) : SOURCEMGMT: net source ‘\\**********\sql\Microsoft SQL Server 2008 DEV R2\x64\setup\sql_engine_core_inst_msi\’ is invalid. MSI (s) (0C:34) : SOURCEMGMT: Processing net source list. MSI (s) (0C:34) : SOURCEMGMT: Processing media source list. MSI (s) (0C:34) : SOURCEMGMT: Source is invalid due to missing/inaccessible package. As the error highlited in red, it is looking for the location of the binaries in the location where it was when the last time sql server or updates are installed as it stores this location in registry in location HKEY_CLASSES_ROOT>installer>Products> then we have to scroll down each product list under with some system number and find one for the SQl server Database Engine services and it will be missing for all other components too. So in order to fix this you need edit manually in registry and find the missing packages using a VB script provided from Microsoft as provide in the KB 969052. The other easy workaround that I found and worked for me is try repair from programs and features > right click on SQL server > click change/remove >repair and not it will ask for the location of the SQL server binaries, once you pointed to the new binaries location it does repair the setup support files in registry and updates the new location of the missing packages for lastusedsource, once this is done reboot the server and re-install service pack and installed successfully. If you click on net under the source list it will display your old location and new locations. It is a good practice to find and monitor your large SQL server tables, we may surprise in some cases where our large audit or logging tables that are not being cleaned up frequently and fill into multiple GB’s of data and may result in higher backup and restore times. Working with your development team on these large tables to see if they are serving any business else can be archived and reduces huge maintenance over head with backup/restores and also saves disk space available. Here is the script that finds top 10 large tables that are ordered by reserved disk space. After setting up Always ON , we need to configure SQL server Alerts to know about the availability Group errors and other failover information you may want to know when occurred. Here is the list of error and scripts to create them. Make sure to enable e-mail operator for each alert after executing above script. What is SQL server Statistics? SQL Server statistics will be used by optimizer to create the optimized execution plans where estimating the number of rows that can be returned, density of pages and statistics object will also hold a histogram of information about the distinctive number of rows and range of typical rows. All this information will be used by optimizer to estimate optimal execution plan to retrieve the data. When do these statistics will be created? SQL server will create statistics object when we create an index on table and statistics object will also be created by SQL server automatically when we use non-indexed column in a where condition of select queries (What this mean is we are missing an index there). Also we could just create the statistics manually. When I run a simple select on this table like below pic (2) will result into a table scan in execution plan as it doesn’t have an index and will still create statistics pic (3 )to make use of them when the same query run every time. Let’s create index pic (4) to get benefited as all we know seek is better than scan when we select for specific rows instead a whole set of rows. When I created the index, now SQL server will create the statistics specifically for this index and these statistics will tell the optimizer how to use this index and get the data faster and optimal. How these statistics will help Optimizer? Let’s take the same above Simple select to see the estimated execution plan. Interesting now, the estimated execution plan is showing that the plan was just created by using the statistics object that was creates along with the index and displays the estimated rows that will returned and other information which estimated and this information was read by Optimizer from the statistics. 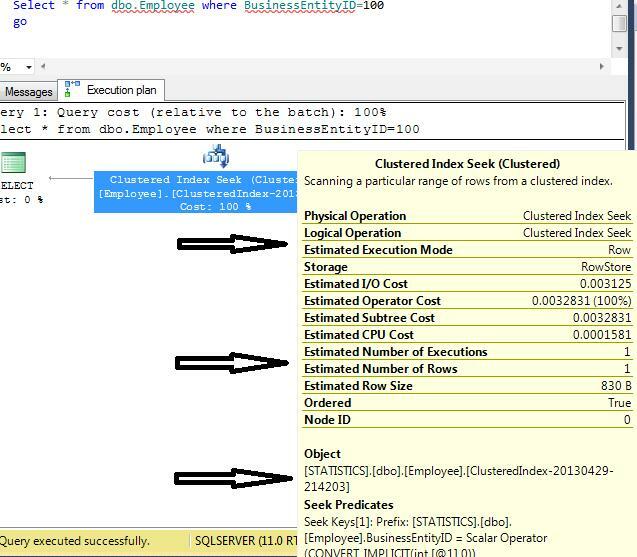 I’m not going into detail how the query was executed internally when the SQL hits the SQL engine to process the query but in general the optimizer which will be in relation engine will use this statistics to create the estimated plan and will handed over the plan to storage engine to get the data where the actual execution plan comes into picture. As long as the estimated and actual plans are same, there will no performance issue as this means that optimizer had the updated statistics. When these statistics got not updated may result in actual plans different from estimated which result in not much accurate plans from optimizer and let the performance down. When do these statistics get out of date? Trace flag 2371 which will change the fixed rate of the 20% threshold for update statistics into a dynamic percentage rate. The higher the number of rows in a table, the lower the threshold will become to trigger an update of the statistics. For example, if the trace flag is activated it means an update statistics will be triggered on a table with 1 billion rows when 1 million changes occur. The best way to check the statistics are out of date is to verify the estimated number of rows in an execution plan to actual number of rows, if they both are almost same then we have the accurate stats and if not then time to update stats. How to automate updating these statistics? The database options to create and update statistics will let you do it automatically by SQL server or Optimizer. But how smart are they on a highly transactional databases and large TB databases with millions of data loads every minute to minute? By default these are enabled. How to perform manual updating these stats? – Resample will use the most recent sample number rows to update the stats. 2. Below update command will update the all stats for specific table or specific index if specified. Also this command will provided with multiple options. I will explain few of them which are important to note while doing this update on large TB of data. FULLSCAN: Will scan the entire number of rows in a table to update the stats. SAMPLE NUMBER: If you are not like to do whole scan of the table rows (Time consuming) and update the stats, we have option to specify the sample number of rows or percent of rows to scan to update or create the stats. NORECOMPUTE: If this option is specified then query optimizer completes this statistics update and disables future updates (AUTO_UPDATE_Statistics). We must carefull while using this option as it will turn off the auto stats for the specified table. What happens to these stats when re-indexing or Re-organizing indexes? How to check when your stats were last updated? What is Parameter Sniffing in simple words? I have been asked recently what is parameter sniffing in an interview. Well, we all know how Optimizer in SQL server works to retrieving the data from the tables. We do also know that Optimizer reads the statistics and internal pre-compiled plans instead generating a new plan for parameterized Queries and Store procedures. Here we are, how Optimizer knows we are executing a similar query as it searching for pre-compiled plan for us because it was reading the parameters we passed to the stored procedure or a parameterized query and it is called “sniffing”. What it counts for Performance, Good or bad? By default, Parameter sniffing is enabled and SQL Server caches the plans and reads the parameters those passed to the stored procedures or parameterized SQL Queries. We benefit from it as Optimizer will go and search for the plan it compiled earlier in cache when we execute the same query again. 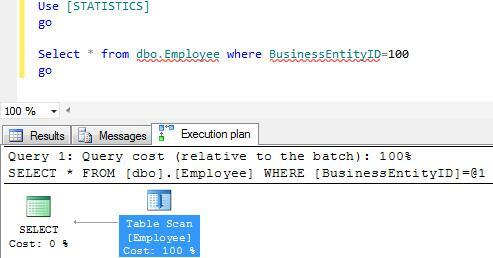 Optimizer will not need to re-create the plan to execute the same query multiple times. This is all good only when there are good statics are maintained and typical parameters are used. What changes day by day is the requirement for using the new parameters with different words and optimizer will tries to use the same old plan in cache and may not be good for the new parameters as data has grown a lot and statistics have not updated yet and may be the plan for new parameter was doing table scans. Until we see a performance issue with this parameter sniffing it is better to leave it by default and we really benefit from it. When we see lot of performance issue, we could disable it using a trace flag 4136, this will disable the parameter sniffing at the server level. How to bring a database online which is in restoring mode ? For Example, In log shipping the secondary or a stand-by database will be in restoring mode while applying the logs from primary for every 15 minutes. In order to perform a DR test, we need to bring the production down and DR database online, this can be achieved by running the below query on secondary server database.